The Gilroy High School Auditorium will be bursting at the seam with magic, glitter, glass slippers, and Golden Pumpkin Coaches. The Gilroy Community Theatre’s Young People’s Theatre will present the Rodgers and Hammerstein musical production of Cinderella. 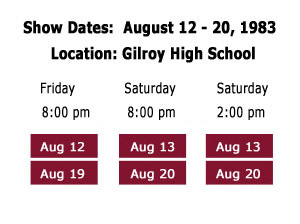 The shows are scheduled for August 12, 13, 19, and 20 with matinee performances on Saturdays at 2 pm and all evening performances at 8 pm. The Apple Company performs on the first Saturday matinee and again on the evening of the 19th and 20th. The Orange Company performs on the evenings of the 12th and 13th with their matinee on the 20th.